Latest and Greatest Mobile Tech News Across the Web! 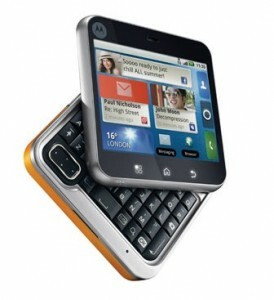 Motorola is set to rival HTC in the ability to crank out Android phones at a breath-taking pace. Motorola has introduced a new phone called Flipout that features a pivoting pop-out keyboard and a compact touchscreen display. The Flipout will have a 2.8 inch screen, 3 megapixel camera, video recording capability, Wi-Fi and GPS. It will run the Android 2.1 version of the operating system. The phone will also have the Motoblur Android skin that we have already seen on other Motorola devices such as the Cliq and Backflip. Motoblur aggregates e-mails, messages and status updates from different social networking sites such as Facebook, Twitter and Myspace to present it as a stream of data on a single screen. With its square form and social networking features, the Flipout seems like a good alternative to Microsoft’s recently launched Kin Two phone. But it is not clear if the device will make it to the U.S. Motorola already has Backflip, a device with a nifty mode that allows its to be placed on the desk like an alarm clock and the Cliq, the first of its phones featuring the Motoblur skin. Sure, its about giving consumers choice but with the Cliq, Backflip, Devour and Droid already out, is there such a thing as too many phones from a company? Especially when the features start to blur and minor tweaks in hardware design are all that sets one device apart from the other. The Flipout will launch in the next few weeks in “certain regions around the world,” says Motorola. The company won’t disclose pricing either but that’s likely to depend on the deals it can ink with the wireless service providers. New 'n Tech provides you with some of the best mobile tech news from the greatest sites/blogs around the web. All credit for the great post New 'n Tech brings you is given to the various sources used to keep you updated. Stay on Top of What’s New!